136 min. Paramount Pictures. Director: John McTiernan. Cast: Sean Connery, Alec Baldwin, James Earl Jones, Sam Neill, Scott Glenn. 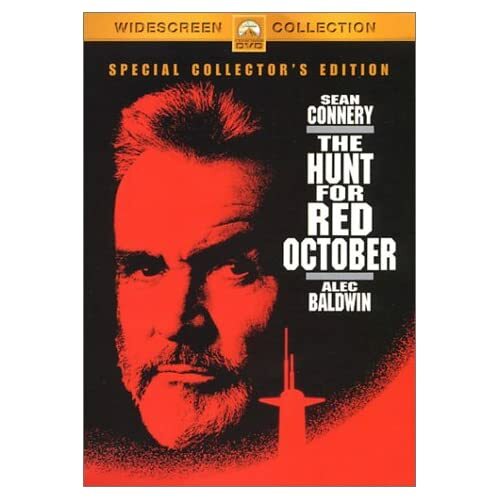 A gripping suspense film with one foot in old-school Hollywood and one foot in the blockbuster age, The Hunt for Red October also came out in 1990, the midpoint between two decades marked by different trends in studio releases. John McTiernan's adaptation of the Tom Clancy novel is a classic submarine movie (yes, it's a subgenre...yuk yuk yuk)—like seafaring predecessors The Enemy Below and The Caine Mutiny, this one's unapologetic about its undiluted testosterone (Gates McFadden of Star Trek: The Next Generation has a blink-and-you'll-miss-her cameo as Jack's Ryan's wife Caroline). The Hunt for Red October functions as a star vehicle for Sean Connery while ushering in another lower-budget action subgenre: the techno thriller. Of course, The Hunt for Red October also launched a franchise around the character of Jack Ryan (Alec Baldwin), a former Marine lieutenant and current CIA analyst who despite his protestations ("I am not field personnel. I am only an analyst") finds himself dangling from a helicopter, boarding a submarine, and wielding a gun after he theorizes that a rogue Russian submarine commander (Connery's Marko Ramius) isn't threatening America with nuclear destruction but rather plotting to defect. The film is, then, a period piece allowing for a Cold War cat-and-mouse game between Ramius and the American military complex as well as his Russian masters, who would rather see him dead than allow the Soviet sub's silent-propulsion technology fall into the hands of the Americans. The consummate craft of McTiernan (coming off of Die Hard) combines with the essence of the Clancy book for maximum tension. Outside of submarine maneuvers and the air drop of Ryan, the film only contains two "action" scenes: a murder sequence that's over in seconds and the climax, contained in the last twelve minutes. The rest is something like what Connery describes in a memorable, misleading monologue addressed to the crew of Ramius' Red October: "our dangerous game, a game of chess, against our old adversary, the American Navy...A great day, comrades. We sail into history." Ramius is described as Lithuanian by birth; McTiernan solves the problems of Connery's Scottish brogue and the film's abandonment of Russian in favor of English in a fiendishly clever and simple use of cinematic language. Though he had already played significant roles in Hollywood pictures (including Beetlejuice), Baldwin has something of a breakthrough role here, and he hits all the right notes to make us believe in an intelligent, capable, but understandably nervous hero though the franchise would continue, Baldwin would jump ship). James Earl Jones inititates the recurring role of Admiral James Greer, and Sam Neill and Scott Glenn do brilliant supporting work as, respectively, captain of the sub USS Dallas and Ramius' right-hand man Borodin. Beginning a tradition followed by subsequent films, there's also a deep-bench ensemble: Richard Jordan, Joss Ackland, Peter Firth, Tim Curry, Jeffrey Jones, Stellan Skarsgård, Fred Dalton Thompson, Courtney B. Vance, and Daniel Davis. Of course, the film belongs to the ever-magnetic Connery, who has an obvious personal kinship with the shrewd Ramius. The real climax of the fine script credited to Larry Ferguson and Donald Stewart isn't so much the armed stalking of a sleeper agent but the scene that precedes it, when Ryan and Ramius finally come face to face. That the scene is so dramatically satisfying is a testament to Red October running on all cylinders: writing, direction, and acting (kudos, too, to Jan De bont for his photography and Basil Poledouris for his score, with memorable use of Russian men's chorus). The filmmakers are much more interested in plot than themes, which speak simply to the common humanity of our neighbors across borders. But as for the film's suspense credentials, you know it's time to get tense when James Earl Jones intones, "Mother of God." 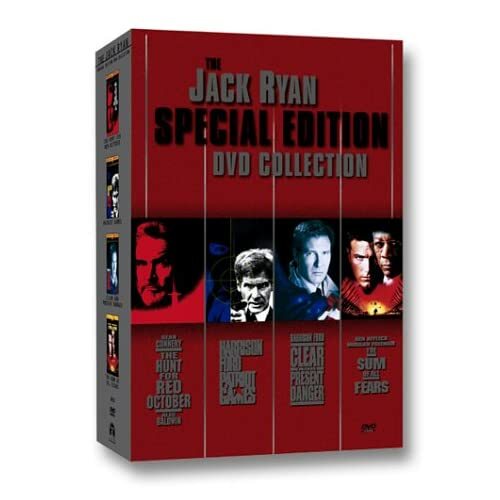 One of four new Blu-Ray releases of the Jack Ryan films, The Hunt for Red October offers a humbly upgraded transfer and the same extras as the previous DVD collector's edition. The transfer seems excissively grainy for an 18-year-old film, though the grain and dirt seem primarily to be the results of the original elements. The few day exteriors look stunningly sharp, while the dark, murky sub interiors, shots with soft focus and mist, and composited special effects sequences give the image the most trouble. As on DVD, increased resolution reveals visible wires on the sub miniatures and edge enhancement is unfortunately evident. For all these flaws, it seems nothing short of a complete clean-up of the film source could possibly improve on this best-yet transfer of the film, which benefits enormously from an awesome, immersive Dolby True-HD track that showcases what's arguably one of the most sonically interesting films ever made. The most detailed bonus feature is a feature-length commentary by director John McTiernan. Though he's not the most inviting or energetic host, McTiernan does demonstrate the keen mind that makes him one of the finest of modern action directors as he explains the project's relationship to the novel and how the film was made, including observations about the actors, special effects, and what he would change if he could. Also included is the nice 2003 retrospective documentary "The Hunt for Red October: Beneath the Surface" (29:00), with behind-the-scenes footage and interviews. Connery is heard from only in vintage clips, but the rest contribute new interviews (new in 2003, anyway): McTiernan, producer Mace Neufeld, Alec Baldwin, screenwriter/actor Larry Ferguson, James Earl Jones, Scott Glenn, DP Jan De Bont and, from ILM, visual effects supervisor Scott Squires, model shop manager Keith London, chief model maker Kim Smith, first assistant camera Bob Hill, DP Marty Rosenberg, first assistant cameraman Vance Piper, DP Patrick Sweeney, DP Carl Miller, and technical director Doug Smythe. You'll learn how the project was developed and cast, how the filmmakers distinguished the subs for the audience and how they were designed and shot; and how Glenn and others got inspiration by studying a real-life sub commander. Lastly, we get the "Theatrical Trailer" (1:41), thoughtfully presented in HD. 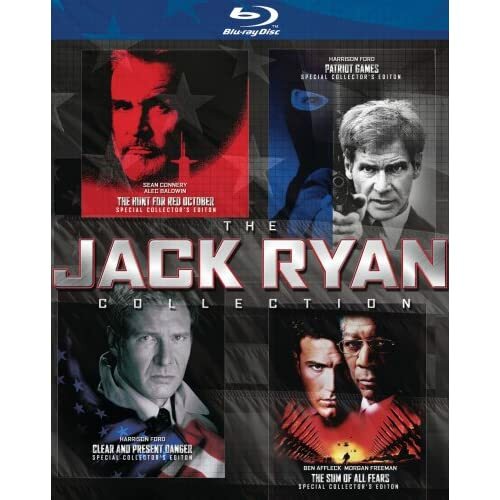 Those who haven't yet taken the plunge for the Jack Ryan films on home video now have especially good reason to do so; even those who have will want to consider upgrading for the improved image quality. All site content © 2000-2019 Peter Canavese. Page generated at 04/21/2019 05:55:13PM.